Really Nice! It's like looking at my own code. Drop the additions to the non-English translation files. Gitblit will default to English for missing keys and it makes it more clear to translators what they need to do as all translations are ordered identically. I'm wondering about the need for RepositoryModel.useSeverity and RepositoryModel.usePriority. I almost think we can drop that too and make the display of the default values more-or-less invisible. If you don't want to use those values, don't change them from the defaults. Might be a good idea to have visual indicators for priority - maybe severity too. They should be displayed in the tickets list, the ticket page, and perhaps in the selectors for new/edit ticket. We might be able to legitimately harvest icons from Atlassian AUI or from a different source. That sounds much better, thought it was a bit awkward as I was adding all those in! Out of interest is it wicket that manages the defaulting to English or is there some additional logic for that? The intention was to keep the UI clean for users who don't use them but it does feel as though it complicates the code far more than the value it provides... Lucene indexes them no matter the config, so it is purely for the UI. Happy to take them out to keep the code simple, as you say if they don't use them the defaults are pretty much invisible anyway. 2.1) I had thought of making the priority & severity enumerations project configurable but it looks like that would require far more changes than I wanted to do on this PR. Lucene indexes them as integers to maintain portability so this could be done at a later date if needed. 2.2) Similar to 2.1 but focusing on language, the strings are generated directly from the enum name, is there a way to disconnect the display name from the enum name? Changes complete, the calculated approach for color indicators didn't display quite as nicely as I was hoping for so I've implemented them as a lookup table for easier tuning to human eyes. The hue range has been widened to include purple at the catastrophic end. Alpha fades out ticket on lower priorities to a minimum of 20%. Default priority/severity settings should look similar to ticket icons in current release. 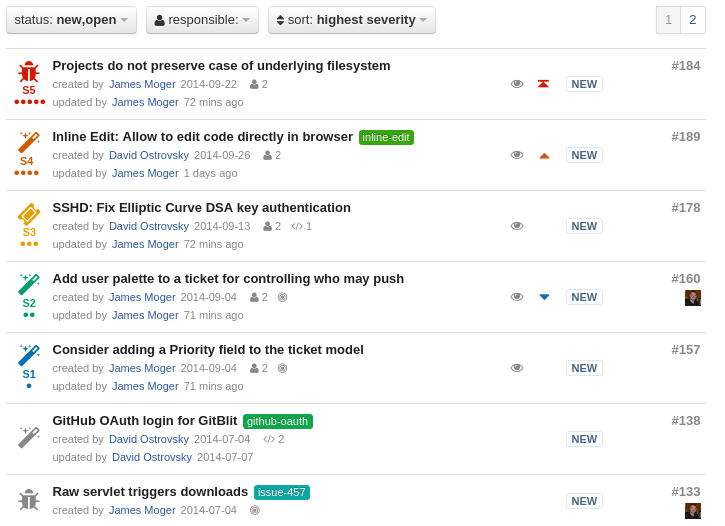 Cleaned pull request into one commit to ease identification of changes. Also updated to display priority icons. I've gotten complaints before from folks with RG-color-blindness about state & use of color. I'm not crazy about the difference between "normal" and "high". I'd advocate that "normal" should have no priority indicator - although it does look pretty. That would make the assignment of a non-normal priority more visually meaningful. case-drop. In the future I may revisit the whole case issue, but for now we have to stick with all lower-case since the rest of the ui is all lower-case. @paulsputer I've made a friendly amendment to your CSS changes which you can find here or at the pr-220 branch in this repository. The general idea is to make red the color for the most important things i.e. ROYGBIV is the guide. I'm also anticipating requests to translate 'C', 'Ca', etc in the CSS so I don't want to introduce that - but I propose a more clear alternative that I think I can defend against translation requests. I've attached a screenshot of the results of this change. If you are fine with this adjustment I'll go ahead and merge. I pulled out the S# text and set the tooltip with the severity from TicketsUI. We still have a translation issue - but all the ticket enums have the same problem and that is a rainy day job. The main thing is the translation is not in CSS which would be unmaintainable. Thanks for taking the time to implement this improvement. It's really great! @paulsputer I'm giving more thought to the severity levels and wondering what your take is. Priority = What should be done first? Severity = How broken is it? What is the bug's impact? I recognize that Severity is a standard term, but it implies bug or something wrong. That doesn't necessarily correlate well with a task, enhancement, or maintenance. What about labeling this as Impact or Importance, instead? Language like that might be generally more useful in triaging. A task or an enhancement doesn't really have severity - but they do have importance or impact which might be orthogonal to priority. What do you think? @gitblit yea it gets rather tricky with the wordings. Priority is the easy one, but severity/impact could have very project specific terms. From a technical perspective I had hoped to abstract these further to allow them to be customized on a per-project basis but I felt the change was already on the large side for one PR, and at this stage my focus is on creating a tool to migrate from Trac to Gitblit without losing this vital information. From what I could gather the project settings uses JGit config API, which doesn’t appear to provide access to a group of KVPs so this may be a bit more involved. The terminology I’ve used here is based on ISO14971 which builds upon the more generic ISO16085 for risk management. Both refer to “probability of occurrence” and “severity of consequence” where the project specific weighting of both together determines the risk and if it is acceptable. All the standards specify that there should be a project specific description for each category, so there is scope for flexibility without going to the extreme of some ticket systems that do away with names all together and just have numbers, though there could be benefits in doing that internally in the code. Merged #220 "Improve the diff page"